The monstrous rain from Hurricane Harvey that has immobilized Houston and adjacent parts of Texas and Louisiana has been predicted in many climate studies—hurricanes and other storms are expected to become more frequent, and more severe. 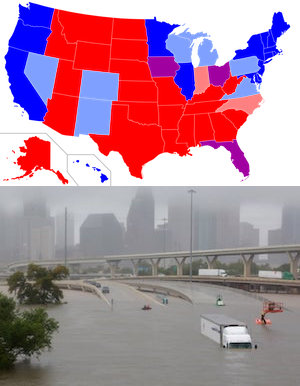 Whether or not Houstonians or other Texans believe in climate change is immaterial at the moment; thousands of people need immediate help and thousands of other people are doing their best to provide it, despite the fact that many streets and highways are underwater. It is the kind of selfless community effort that has been in extremely short supply lately, and it represents the sort of empathetic teamwork and can-do cooperation that America was once known for. Top: Wikipedia, By Angr – self-made; base map is Image:Blank US Map.svg, CC BY-SA 3.0, https://commons.wikimedia.org/w/index.php?curid=3532565. Bottom: Richard Carson/Reuters. Another kind of cooperation is represented by the nine Northeastern states of the Regional Greenhouse Gas Initiative that have teamed up to implement a far-reaching cap-and-trade program to improve the environment and deliver more efficient energy to the region. Not surprisingly, California has implemented a similar effort, and it would represent a great step forward if the people involved in these efforts on both coasts would decide to combine their efforts. Adding Oregon and Washington State, along with traditionally blue states in the Upper Midwest and the holdout states in the Northeast (Chris Christie’s New Jersey, plus Pennsylvania), would be a bolder move still. The two instances of citizen and governmental cooperation cited above are very different: one has arisen in response to a grave natural disaster, and it has brought out the best qualities of the many people serving as rescuers and volunteers. The coastal environmental programs are a more considered and more thoughtfully planned effort to head off the sort of catastrophes afflicting Texas and Louisiana at this very moment, or at least reduce their frequency and impact. Both efforts have one very important factor in common, though: they run counter to current Trump administration policies aimed at stripping government power from every area of public life. Trump, who pardoned racist Arizona sheriff Joe Arpaio as Hurricane Harvey made landfall because he thought media ratings “would be far higher than they were normally,” plans a visit to Houston today. The city is not really equipped to receive a presidential visit during this emergency, and it’s hard to imagine Trump touring the city by boat. He would serve the area best by staying away. So far, the dysfunction at every governmental level that was evident from the beginning during Hurricane Katrina in 2005 seems missing—the Harvey rescue efforts appear to be working for the moment. But massive, years-long rebuilding efforts are forecast, and it remains to be seen how helpful Trump and whoever remains in his administration will be in delivering the needed assistance for those efforts. Citizens working together to help one another in Houston are a refreshing counterpoint to the multiple Trump rallies at which everyone outside his base is excoriated. And the “blue” state governments that have decided to take on the environmental work the Federal government has turned its back on may yet help save the country from even worse weather-related events. In both cases, local citizens and governments are cooperating with each other in order to resist the destructive dismantling of government in Washington. (The selfless Texas rescuers may not think of it this way, but that is what they are doing nonetheless.) Both examples are essential and heartening, and we need to see more on both fronts.